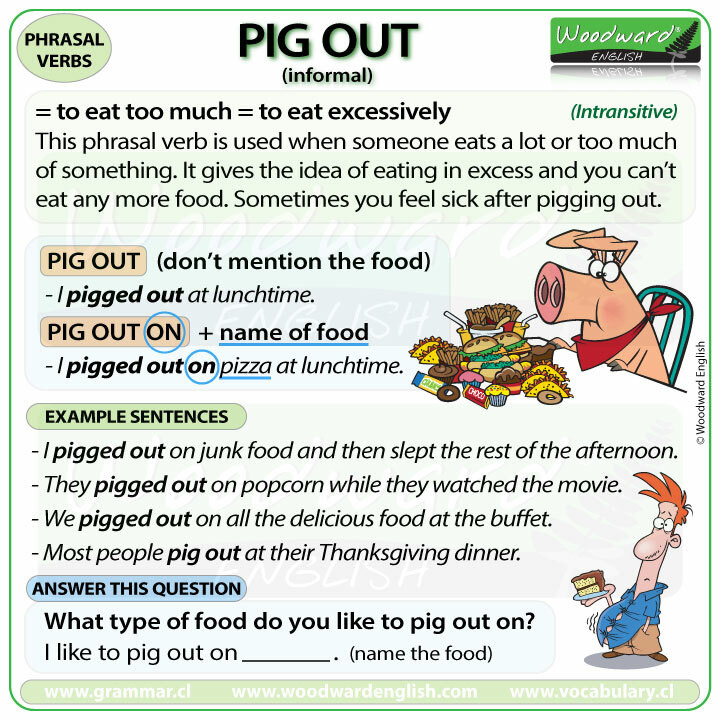 To pig out is an informal phrasal verb. (intransitive) It means to eat too much of something or to eat excessively. It gives the idea of eating in excess and that you can’t eat any more food. A result of pigging out is that often feel you cannot move or sometimes you feel sick from eating too much. There are two ways of using this phrasal verb. I pigged out at lunchtime. I didn’t mention what I ate so just pig out is used. But if I mention the food, we say pig out ON then the name of the food. I pigged out on pizza at lunchtime. I specify what I ate, the pizza, so we used pigged out ON pizza. Notice how pigged out and pigging out have two Gs. We use a double G in its past tense and continuous tense form. When you pig out on something, this something is mostly unhealthy food. As we saw in the last example I pigged out on pizza, which isn’t considered healthy. You can pig out on chocolate or cake. You can pig out on many yummy things. You are not likely to pig out on a salad because one, it is healthy and two, it is hard to have a full stomach just by eating salad. I pigged out on junk food and then slept the rest of the afternoon. They pigged out on popcorn while they watched the movie. We pigged out on all the delicious food at the buffet. Most people pig out at their Thanksgiving dinner. Now it is your turn to give an example. What type of food do you like to pig out on?